Kolkata Knight Riders would aim to score their third successive triumph and extend Deccan Chargers' winless streak when the two sides clash for the second consecutive time in three days in an IPL match in Kolkata on Thursday. On paper, the Knight Riders might have won four out of their last five matches to suggest that they have become a force to reckon with. But a closer look would reveal that they are still a struggling a bit as far as their batting line-up is concerned. Former IPL champions Deccan Chargers are yet to click as a team with their butter-fingered fielders responsible for their last few losses. Having lost all their five matches, Deccan Chargers will now have a tough task in the remaining 11 to go beyond the league stage. Knight Riders stutter to a last over victory after yet another top-order collapse. As the Knight Riders huffed and puffed chasing the small total, it once again brought back the memories of their two-run loss to Kings XI Punjab in another low-scoring chase of 135. Yusuf Pathan is yet to justify his $2.1 million price tag as he aggregates 29 runs from seven matches this season, averaging a pathetic 5.80. The Baroda all-rounder, who was instrumental in Rajasthan Royals' triumph in the inaugural edition, is yet to score a half-century for the Knight Riders. In a small chase with low-asking rate, the Knight Riders think tank did their bit by promoting Yusuf to No 5 on Sunday but he failed to shake off his poor form. Out-witted by opposition bowlers on several occasions, Yusuf seemed to be totally out of touch in his six outings so far. As the Knight Riders approach the crucial home stretch of two matches (Deccan Chargers and Royal Challengers Bangalore), the team might promote a youngster in place of Pathan. "He needs to deliver, to be very honest. He just can't keep playing these kind of shots. He is an important player for us. Hope he can get back to runs as soon as possible," a livid Gambhir had said after their two-run loss to Kings XI Punjab. 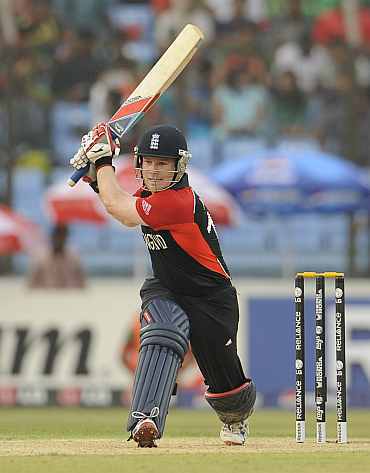 As the batting constantly flounders, it's high time that their English recruit Eoin Morgan gets a chance this edition. Known to be a finisher, Morgan might come in handy for the out of sorts Knight Riders batting. But with the four-foreigner rule, it would be a headache for the Knight Riders to achieve the perfect blend. From the five Man-of-the-Match awards the Knight Riders have won, four -- Laxmipathy Balaji, Shakib Al Hasan, Sunil Narine and Brett Lee -- have been bowlers. At the Barabati, it was Lee's last two overs in which he conceded just four runs -- in the 15th and 17th overs of the Chargers innings -- that proved to be decisive in the Knight Riders' win. At the Eden, known for its slow and difficult track, Shakib Al Hasan is expected to make a comeback, as the Bangladeshi left-arm spinner would look to trick the Chargers batters alongside Windies offie Sunil Narine. Having lost five matches on the trot, it will be a tough ask for the Chargers to make a turnaround from here on and skipper Kumar Sangakkara will be under huge pressure. Four times out of five, they have let it off from a winning position, something that has hurt the team's cause badly. If in the last match, Das was dropped at a crucial stage of the match, Kevin Pietersen of Delhi Daredevils was dropped thrice by their butter-fingered fielders. Their coach Darren Lehmann described their groundwork like that of an Under-14 side. "We got a great start, was a great platform. We should have got 150, but KKR fielded brilliantly. We can talk about another missed catch probably, but we bowled well, and made it difficult for KKR," Sangakkara said on Sunday. Kolkata Knight Riders: Gautam Gambhir (c), Brendon McCullum, Manvinder Bisla (wk), Jacques Kallis, Yusuf Pathan, Manoj Tiwary, Debabrata Das, Rajat Bhatia, Sunil Narine, Laxmipathy Balaji, Brett Lee, Eoin Morgan, Marchant de Lange, Ryan ten Doeschate, Pradeep Sangwan, Mohammad Shami Ahmed, Jaidev Unadkat, Iqbal Abdulla, Iresh Saxena, Sanju Samson, Sarabjit Singh Ladda and Chirag Jani. Deccan Chargers: Kumar Sangakkara (c), Shikhar Dhawan, Parthiv Patel (wk), Cameron White, Jean-Paul Duminy, Ishank Jaggi, Ankit Sharma, Dale Steyn, Amit Mishra, Anand Rajan, Veer Pratap Singh, Chris Lynn, Daniel Christian, Daniel Harris, Juan Theron, Abhishek Jhunjhunwala, Ahmed Quadri, Akash Bhandari, Akshat Reddy, Arjun Yadav, Ashish Reddy, Atchuta Rao, Bharat Chipli, Biplab Samantray, Dwaraka Ravi Teja, Manpreet Gony, Sneha Kishore, Sunny Sohal, Tanmay Mishra, Tanmay Srivastava and Taduri Prakash Sudhindra. Match Starts 8 pm IST. IPL V: It's Over... and out!